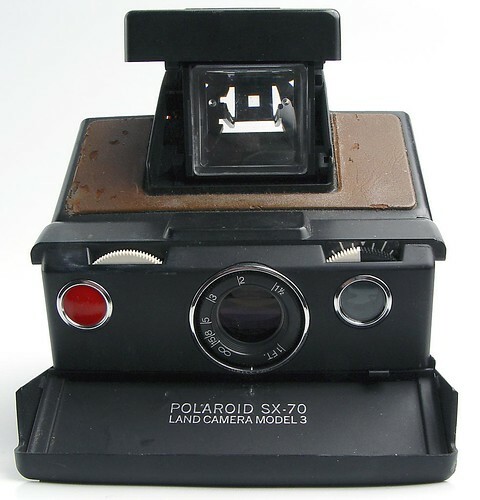 The model 3 was the only SX-70 that wasn't an SLR and it was also the least expensive SX-70. It still has the same black and tan 70s' styling and lens, but with scale focussing rather than a more accurate SLR split screen. I wish I'd known this when I answered the ad on Craigslist which resulted in my buying this example for $15. To be honest I thought all SX-70's where SLR's and I didn't even notice that this example was a scale focusing version until I got it home. I was going to try some Polaroid manipulations but I was so upset at being landed with the cheap version that it has languished, collecting dust, on my bookshelves. I'm not sure why I'm punishing the camera for my own stupidity.